I’m Brazilian, have a degree in History and teach the oracular use of runes. I have been fascinated by mythology and esotericism since I was a child. I began my journey in Wicca about 6 years ago and since then I found myself spiritually by rediscovering the Ancient Gods. I am a priestess of the Minerva Owls coven, an eclectic coven with influences of traditional Wicca, natural magic and shamanism, based in São Paulo / Brazil. 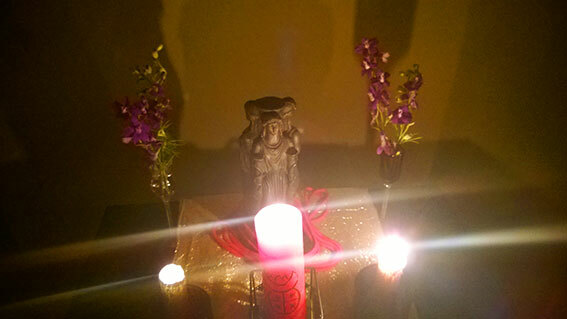 I started my work with Hekate in 2012, when I was called to her service, and since then I have integrally dedicated myself to Goddess in my personal practices. Looking to learn more about Hekate, I met Sorita d’Este and the Covenant of Hekate in a lecture in Brazil in 2014. The Covenant of Hekate became a rich source of knowledge and information for my improvement as a devotee of the goddess. Currently I’m a student of the Priesthood of the Sea in the Water Temple, managed by Ness Bosch and co-responsible for the Covenant Project Recipe Cookbook for the Goddess Hekate with fellow Torchbearer Dorn. As a Torchbearer, I want to assist the devotees in their reconnection and rediscovery of the Goddess and to expand the sacred flames of Hekate to wherever I can.